Jeffrey David Fahey (born November 29, 1952) is an American film and television actor. He has portrayed Captain Frank Lapidus on the ABC series Lost and the title role of Deputy Marshal Winston MacBride on The Marshal. Fahey was born in Olean, New York, the sixth of 13 siblings in an Irish American family. His mother, Jane, was a homemaker, and his father, Frank Fahey, worked at a clothing store. Fahey was raised in Buffalo, New York, from the age of ten and attended Father Baker's High School there. Fahey left home at the age of 17, subsequently hitchhiking to Alaska. He later backpacked through Europe, and worked on an Israeli kibbutz. In 1985, he received his first major role in film, playing Tyree in Silverado. In 1986, he starred in Psycho III as Duane Duke, a money desperate guitarist. That same year, Fahey guest starred on the Season 3 premiere of Miami Vice as gun dealer Eddie Kaye, famously destroying Detective Sonny Crockett's Ferrari Daytona. In 1990, Fahey starred alongside Marisa Tomei in the TV movie Parker Kane, and alongside Clint Eastwood in the Eastwood-directed White Hunter Black Heart. In 1992, he starred alongside Pierce Brosnan in The Lawnmower Man. In 1995, Fahey was the lead in the Trimark Pictures adventure film Eye of the Wolf, directed by Arnaud Sélignac, based on the book "KAZAN" by James Oliver Curwood. In 1995, he starred as "Winston McBride" on ABC's The Marshal. In 1999, he played the main character in Apocalypse II: Revelation. In 2007, he appeared in the Robert Rodriguez film Planet Terror and starred in Messages with Bruce Payne. Fahey appeared as daredevil Dutch the Clutch in an episode of Psych at the beginning of the third season of the show. Fahey played Frank Lapidus, the airplane and helicopter pilot of the research team sent to the island in Lost, as a recurring character in the fourth and fifth seasons, and as a regular character in the sixth season. In 2010, he had a major role in the Robert Rodriguez's action film Machete. In 2013, a new production of the classic play Twelve Angry Men took place at the Garrick Theatre in London, running until March 2014. Fahey played the part of the last juror in the story to change his vote to not guilty. Other notable actors appearing in this production were Martin Shaw who played the part of juror number 8 (a role made famous in the 1957 film by Henry Fonda), Robert Vaughn and Nick Moran. 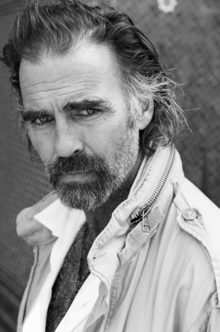 In 2015, Jeff Fahey starred in History Channel's mini-series Texas Rising as Tom Rusk, the Secretary of War for the new Republic of Texas who fought alongside General Sam Houston. In 2017, Jeff Fahey joined the UK tour of Bill Kenwright’s production of Gore Vidal’s "The Best Man" where he plays the part of US Presidential hopeful Joseph Cantwell against political rival William Russell, played by Martin Shaw. In 2006 and 2007, Fahey spent time in Afghanistan assisting the newly established American University of Afghanistan, and launching a project to assist orphans in Kabul. Fahey's recent humanitarian work has revolved around the U.S. Committee for Refugees and Immigrants, in which he has been focusing on the subject of warehousing, a practice in which the rights and mobility of refugees is restricted by a host country. Fahey's work specifically has addressed the subject of warehoused Sahrawi refugees in Algeria. Planet Terror (2007) as J.T. ^ Pergament, Alan (1995-08-23). "Jeff Fahey, Hard-Working Lawman". Buffalo News. Retrieved 2007-12-10. ^ Eberth, John T. (2008-01-30). "Olean-born actor joins 'Lost' cast". Olean Times Herald. Retrieved 2010-09-04. ^ Fiona Mountford (12 November 2013). "Twelve Angry Men, Garrick Theatre - review". London Evening Standard. Alexander Lebedev/Evgeny Lebedev/Daily Mail and General Trust. Retrieved 24 January 2014. Wikimedia Commons has media related to Jeff Fahey. This page was last edited on 30 March 2019, at 22:12 (UTC).